“Can I use regular household products to maintain my swimming pool?” That’s what most pool owners ask and often don’t get the right answer. It sounds fanciful, to say the least and if you have even asked your local store attendance, you surely have lots of doubt about these products. However, the BBB Pool Method was developed by PoolSolutions and the phrase was created by CarlD, a PoolForum moderator. What is the BBB Method? BBB are three letters that stand for Bleach, Baking Soda, & Borax. With the BBB in place, the only other pool chemical you will require is Muriatic Acid (which we will look later). The active element in household bleach is sodium hypochlorite. Hypochlorite is also the same active element you will find in chlorine. In the BBB method, bleach will act like a sanitizer that will prevent harmful organisms from developing in your pool. 2 teaspoons are enough for cleaning 26 gallons of water. There are a lot of misconceptions about using this product to clean swimming pools or as a sanitizer. Bleach will turn your swimming pool plaster yellow and create cloudy water and ammonia. The reality is that bleach acts just like the normal liquid chlorine you get at your local store and the one used by pool service provider companies. The difference is that it’s slightly weaker than the chlorine. This product will increase the total alkalinity of your swimming pool. Alkalinity comes in handy to keep the pH level of your pool in the right condition, which will then allow the bleach to remove contaminants and bacteria. ½ a teaspoon of this product can treat about 26 gallons of water. Borax is readily available in the laundry section in the grocery outlet and will boost the pH of your swimming pool. As you might be aware, the pH will affect a lot of things including the effectiveness of the bleach when cleaning your pool and even how the pool water will affect you when swimming. If the pH is unbalanced, you can easily have irritating eyes, itchy skin, and even red eye and skin. The right pH to take a dive in is between 7.2-7.6. ½ a teaspoon of borax can treat about 26 gallons of water. How Does the BBB Method Work? The BBB method is actually easier than what most people think. There is no secret or magic formula. Fundamentally, you only need to worry about the pH level and chlorine, and everything else will fall in place or is just secondary. You simply raise the PH with Borax from your local grocery store and reduce it with Muriatic acid, from your Home Depot/Lowes or hardware store. Total alkalinity in mainly (merely) a buffer to keep your pool’s pH level stable; you can raise the total alkalinity using baking soda. Chlorine stabilizer (cyanuric acid) only prevents the sun from breaking your chlorine down faster. It is easy to add but hard to lower and can easily affect your pool chlorine level. Calcium for calcium hardness is required for concrete swimming pools and should be considered in a swimming pool with heater. It is generally not needed for a vinyl pool. Most of the other pool chemicals are simply junks and useless. The ones that are needed are only required when something is wrong. Using these chemicals when you don’t require them will mess your pool – so, avoid them. Shock! We all know you cannot buy shock but you need to shock your pool by increasing the chlorine level in order to kill anything growing in it. Thus, all chemical labeled shocks are simply normal chlorine at a concentrated level or stuff that shouldn’t enter your pool. By now you know that Muriatic acid is used to lower both the pH level and alkalinity of your swimming pool. It is the safest method. The dry acids have been shown to stain your facility if they are used the wrong way and you will require a larger amount to get the same results as 31% Muriatic acid. Also, remember that the alkalinity and pH level are twins – lowering one will also lower the other. In short, if the alkalinity gets over 120 and the pH is 7.8, you will need to reduce them with acid. This is where you will need a good test kit with an Acid Demand test. You should never try the BBB method if you don’t know how to test the pool water. Depending on how hot the season is and how big your pool is, you might need to test it once per week or even every day. You can even use a basic 5-in-1 kit and also use test strips to double check the results. Almost all chemical computations are based on 10K gallons of water. Therefore, knowing the size of your best above ground pool and unground pool is important. You shouldn’t just guess the amount of water in your pool and start the treatment process. It might seem small but water can be deceiving. NOTE: Part of effectively doing the BBB method is having time to wash your pool, a clean filter, and good working pool tools. All the products and chemicals might get a little bit puzzling, but the objective is to keep your swimming pool sanitized, by killing all germs and algae, and clear, by keeping the pH level balanced and the chlorine sufficient to burn up what the filter cannot remove. pH to make sure that your pool is neutral (not acid nor basic). Chlorine to sanitize your swimming pool. The normal chlorine level should be 5% of your CYA or 2 ppm, whichever is higher. If the CYA is 80, you should maintain 4 ppm and if it’s 40, maintain 2 ppm. You might have come across the pH scale that runs from 0-14, in a science class. Super-acid, such as pure hydrochloric acid is “0”, while super-basic, such as pure lye is “14”. Vinegar and lemon juice are weak acids, borax and baking soda are weak base. Your body’s pH will range from lemon juice to borax. But for different reasons, your swimming pool needs to be slightly above neutral or somehow basic and should range from 7.2-7.8. You can reduce the pH if it’s too high by adding acid – 31% Muriatic acid or dry acid granules. In the BBB method, we have opted for the Muriatic acid which is readily available at your local hardware stores. You can raise pH using 20 Mule Team Borax which is readily available in your local green store. You can also use soda ash but this will increase the alkalinity as well. So, use Borax to raise only the pH. Bleach is a sanitizer. It will kill germ and algae and it’s the only product you should use for your pool. The bleach will also remove excess suntan lotion as well as other stuff. Hence, you can add laundry bleach to your pool or the more concentrated pool bleach. These are also readily available at your local store. Other types of chlorine play their part, but they have lots of side effects. For instance, dichlor is 50% stabilizer and 55% chlorine (that’s a bad thing no matter what you want to achieve). But these are not critical. Test strips will work effectively for chlorine and pH but not for the stabilizer. There has been a lot of debate, in pool forums, about total chlorine, free chlorine, and combined. If you own an outdoor swimming pool and follow the BBB pool method, that won’t matter since the chlorine in your swimming pool will be free chlorine. The chlorine level should be 1-50 ppm but begin at 3 ppm, and then change according to the CYA and whether your pool is working properly. Chlorine Fear: Phobic or Rational? People usually fear chlorine in their swimming pools. But you shouldn’t. The risk from chlorine is quite exaggerated, especially on outdoor facilities. Pediatricians and dermatologists use “bleach baths” to treat skin conditions and eczema, no prescription needed. These baths involve patients being soaked in 50-100 ppm and there is no stabilizer. Even the kids…what should you fear? The reasoning behind the BBB method is that you add only what you need…no more! You should never add a swimming pool chemical since it “might help”. It probably will not and will make things to get worse. Here is a critical thing that you should know: pool chemical companies and pool stores make little cash when your swimming pool is running smoothly and thousands of dollars when it is all messed up. In short, if all pool owners adopted the BBB pool method, at least half of pool chemical companies and stores would shut down. Chlorine at about 2 ppm but about 5% CYA. CYA between 30-60 ppm (80 if there is a salt system). We often use Borax to raise pH, bleach to sanitize and chlorinate, Muriatic acid to reduce pH and stabilizer, either through dichlor or directly to make chlorine last. Note that Baking soda is rarely used in BBB Pool method. Once you understand how it works, you will require to test your pool 2 times and add chemicals 2-4 times per week. If you use bleach and an OTO kit, this process can take less than 30 minutes. Cost – This method is quite affordable when you compare it to most traditional methods. All the products that you require are readily available at your local store or you can simply order them online. Time – This is a time-saving method. First, you don’t need to mix any chemical that can take time before you get the right proportion. Also, you don’t need to wait for a professional to do it for you. It is similar to using a dolphin robotic pool cleaner to clean your swimming pool. Mistakes – There is no chance that you will screw up your swimming pool when you use these products since they are not as harmful as other pool chemicals. Maintained pool – Lastly, these products are able to maintain your pool all year round. And you can swim as soon as you finish treating your pool. Trust the experienced folks on online pool discussion forums. They have the knowledge and it is free. Once you understand them, it will be much easier to follow and start maintaining your pool through DIY methods. The pool store companies raise numbers that your pool doesn’t need. Change your filter sand regularly to ensure that your pool cleaner effectively. BBB pool method is a proven method that has shown to be effective in pool maintenance. We hope that you have understood the basic of this method and ready to maintain your pool like a professional. Fire is a vital necessity. The Homo erectus (ancient man) invented fire during the Upper Paleolithic Period (Stone Age) for some reasons after discovering that he needed it. As well, you might already know that man has been a survivor since the early days. Fire became part of his survival necessity for cooking and hunting. The critical discovery of fire dates back to about 1.2 million years ago. Today, we don’t want to look at the history of fire but firewood for sale near me and the best firewood suppliers near you. This will provide you with great insight to know where to buy firewood in 2019. Firewood is a renewable source of energy, thanks to the heat the plants get from the sun and use it when growing. Use of firewood helps you to save on utility bills. Wood is 6 times more affordable than electricity, 5 times cheaper than gas, and 4 times cheaper than oil. Local wood sellers have an impact on your economy since they pay tax. Quality wood slits and chops from hardwood and other softwood produce extreme BTU that can keep you warm during the cold months. Burning firewood produces the same amount of Carbon IV Oxide as when they are rotting. Hence, there is no global warming when buying wood. Firewood will never experience power blackouts like electricity during the storms or heavy rains. Thus, you are assured of a steady source of warmth. Good quality wood will make it easier to light and maintain the fire and even make your fireplace safer. Getting the right firewood supplier can be a daunting task but it doesn’t have to be that way. So, what should you do to ensure that you get your wood from the best firewood supplier? Proximity – Distance is a critical factor that you should consider when choosing your firewood supplier. This is important because it’s very expensive and difficult to transport firewood from one place to the other. References – The best wood supplier doesn’t need to place adverts everywhere to be known. These people have lots of demand just from recommendations from their previous customers. Measurements – Often, firewood measures about one cubic meter if the log is one meter long. You can easily determine the size you want and inform the supplier to provide that size. Drying – You will see hundreds of stockpile of logs lying around if you drive around the countryside. These are logs that have been left to dry and the rule of the thumb is: buy firewood that has been around for at least 2 years since it will contain the least moisture and burn more efficiently. How much to buy? – The amount of firewood you purchase will depend on how you intend to use it. Do you use it every day or just occasionally? This should dedicate the supplier you choose – one who provides bulky or one who provides small quantities. How much to pay? – Price usually varies from as little as $20 to as high as over $60. This will depend on the length of the firewood you buy – for example, a one-meter log will be more expensive than a 55 or 33 cm firewood. Storage – Lastly, you need to get firewood that you can be able to store easily. Ensure that if the supplier delivers the wood with a tractor it will access your desired storage area. Here are a few recommendations that will help you to get the best firewood supplier near you. The internet and technology have made it easier to find the nearest firewood suppliers, thanks to the Google Map. The best thing about Google Map is that it also provides directions to the located firewood vendor. Google Map also has about 99.9% accuracy when estimating the distance, not to leave out the quickest route to the supplier. It is a great place to start your search for reputable firewood suppliers near you. Although most local searches will take place online via Google Local, local listings and adverts (Radio/TV commercials, billboards, magazines, and websites) can always be a great place to start your search. For example, you can try Craigslist if you are in the USA. Also, you shouldn’t forget that other reliable sites can come in handy when narrowing down a supplier near you. A quick search will always bring out some amazing results. However, always be careful when choosing firewood suppliers online. Although the internet is right, you can easily run into a scammer pretending to sell firewood. Your family members, friends, and neighbors have used these services before and gotten great firewood. Asking them for recommendation won’t hurt or cost you anything. After all, word of mount spreads pretty fast and this will save you not only money but time. You shouldn’t ignore the power of social media such as Instagram, Facebook, Pinterest, and others. There are thousands of business profiles on these places and a simple search on your computer or phone is handy. This search will pull up dozens of results that you will be spoilt of choices when choosing vendors stocking wood near you. Definitely, Amazon is the biggest online retail media and from it, you can buy anything and everything. From the best seeding machines, pull behind aerators, pedigree puppy food, lawn mowers, high-quality animal feed to firewood, you are only a click away from finding firewood for sale near me. A sawmill’s primary function is to provide usable lumber from logs, but it doesn’t use 100% of the log. You can take advantage of this by gathering up all the scraps the sawmills don’t need, something you can get at a low price. In fact, some sawmills might be willing to give you these scraps for free since you are disposing of their waste. They can even reduce the cost if they let you take some of the remains from their store; it is a win-win situation. You cannot construct a home or building where there is a forest. You should take advantage of this situation where an individual or company is cutting down trees in order to build a structure. The company or individual might be selling the fallen trees at a throwaway price since the motive is to clear the area. You can easily choose the firewood that you want and leave the rest. If you are an expert and have the tools to prune branches, this can provide you with an opportunity to get firewood. You can advertise the trimming services and even say that you buy the logs. This way you will get the firewood you require at a cheaper price and still earn from your everyday job. Alternatively, you can contact your local trimmer and ask if they can sell you firewood when they finish trimming. When the vendor delivers your firewood, have railroad ties, pallets, or a DIY firewood rack in place to stack it to lift it from the surface. Wood lying on the surface is a disorganized pile that won’t get sufficient air to dry it completely. To effectively dry your firewood – what is called seasoning – you need to choose a place where the rays of the sun and the wind can reach the wood. When stacking, cross your firewood in alternating patterns for every level to ensure that there is space between the wood. Ensure that you choose good, level logs when you approach endpoint or corners. This crisscrossing technique enables for both free movement of air and more stable woodpiles. By leaving your firewood to dry for about 6 months or one summer season, you can easily achieve 20% desired moisture level. That might vary depending on the conditions and species of wood you buy. The only way to know is your firewood is dry is to look for crack marks near the ends. Seasoning of firewood involves getting rid of moisture or green wood by about 80%. The moisture meter should read at most 20% moisture content. When you do this, you can rest assured that your wood will last longer in your store and catch fire very easily. Wet logs produce more smoke and less heat. Some studies show that green Oakwood contains about 55 gallons of water, making it hard to burn if not seasoned. But there are exceptions like green ash or fir since they burn brightly even when wet. Seasoning should start immediately after summer and continue for about 9 months. However, note that factors such as air and weather condition will determine the level of moisture left in your wood by the time the 9 months are over. Lightweight due to moisture loss. Splits logs have less moisture. White on the inside and dull grey on the outside like lumber from sawmills. Signs of cracking at the end of the log. Producing hollow sound when splitting the wood. Loose bark but not really easy to peel. Producing of a woody smell. Generally, most homeowners don’t like walking via the snow during the night to fetch firewood. Nor do they like rodents or bugs in their houses from firewood left indoor. This is why they have a woodshed. A woodshed is any covered place in your yard that is about 30 feet away from the house. Although it’s okay to have some firewood in your house ready for use, it is more suitable to store your seasoned wood in a covered woodpile or woodshed. There are building plans available for these sheds that are as stylish and creative as they are dry and solid. Here are a few questions that most firewood seekers ask when looking for firewood. Q: What is a cord? A: A cord is a wood piling volume of 128 cubic ft. or measurement of 4h by 8w by 4l. A 1/3 of a cord is called a face cord but it isn’t a standard measure. Q: Is weight determined by the cord? A: Your warming and cooking firewood weight will depend on the plant you choose and the moisture content. Hence, a cord doesn’t determine the weight. Q: Seasoning and Kiln-drying: What is the difference? A: A kiln-drying takes place within hours and you can use your wood within a short time. You should note that firewood that has undergone Kiln-drying has a USDA certificate label. Seasoning takes a long time, even a year before the wood can be ready for use. Q: How soon will my firewood arrive? A: Generally, your firewood should arrive within a couple of hours after buying (if you buy from a local supplier) or a couple of days if you buy from an online store. International orders can take up to 7 days or more, depending on where you are located. Q: How much will cord cost me? A: Although you can easily get a cord that goes for less than $50, this price can rise depending on the wood you buy – hardwood or softwood. You should also note that the suppliers will charge different, according to the demand and their reputation. You might have heard about solar pool covers whether you own a pool or not. And if you have never, then you need to read this article to learn more about these covers. This article will teach you everything about solar pool covers, and of important teach you how to install them. Therefore, you will be able to solve the mystery of solar pool covers bubbles up or down. You probably have used a safety pool cover. But why would you require any other type of pool cover? Because a solar pool cover will not only keep debris and dirt out of your swimming pool – it will actually heat the water. A solar pool cover is a cover that captures energy from the sun and takes it into your swimming pool water to warm it. This type of cover also helps to reduce evaporation, meaning that you save money that you would incur if you heard to feel chemicals regularly. When Should You Use a Solar Pool Cover? Any time you are not using your above ground pool or in-ground pool is a great time to use your solar cover. Especially during the night when the weather is extremely cold. Less chemical use – These covers are able to shield your pool from the harmful UV rays that burn pool chemicals. Better energy efficiency – They also conserve heat in order to reduce the need for using pool heaters. Less pool maintenance – Solar pool covers are also able to keep dirt and debris out of a pool. More comfortable swims whenever you want. Do Bubbles Go Up or Down on Solar Pool Covers? To know whether to put the bubbles up or down, you first need to know how solar pool covers work. How Do Solar Pool Covers Works? As your swimming pool sits under the hot sun, it naturally gets heated from the sun’s energy. This is why you will find the water to be warm during the hot season of the year. But if natural heat enough to keep your pool ready for swim throughout the year? This is why most people will use solar pool covers – they are a dependable source of the required heat. These covers are able to provide a barrier between the surface of the pool and the atmosphere. They function like a lid that covers your swimming pool to prevent heat loss. Besides, solar pool covers help to heat your pool faster. And this is why you need to apply the cover the right way. When placing your solar pool cover always ensure that the bubbles side looks down. The sun rays heat the air inside the bubbles and then heat is transferred into your pool. That’s why you should make sure that the bubbles are facing the water. Moreover, the solar pool covers trap the head inside your swimming pool, so your facility will remain warm during the cold months. This means that they enable the water to retain heat that was acquired during the day. Another thing you should note about solar pool cover is that they will allow you to swim as if they weren’t there. What if the bubbles face down? What will happen? If you place the solar cover while its bubbles are facing the sun, the process of warming your swimming pool will take longer and the sun might even damage these bubbles. That’s because they are not facing the water directly. They will overheat in the atmosphere with nowhere to take the collected heat. Therefore, the sun’s ray will flow through the cover, instead of the air, before they can reach the water. How Can You Make Solar Covers More Effective? There are a few things that you can do to make your solar pool covers more effective when warming your pool. Although your pool heat pump won’t collect energy from the sun, it will harness the heat. Actually, the hotter it’s, the better the pool heat pump will work. This is because it uses an evaporator coil as well as fan to collect natural heat and then turn it into hot gas for warming your pool. A solar pool heater uses fixture of panels that are installed on a roof, joined with a pool pump. The panel collects the heat from the sun while the pump takes water to the roof, where it gets heated. Of course, many people know that there are days when the sun won’t come out and this is why they use pool heat pumps as well as solar pool heaters. This combination is not only reliable but also energy efficient when heating your pool. Have you ever wondered what would happen if you leave the solar pool cover on but forget to operate the other systems? There will be a lot of heat loss. However, with an auto timer, you don’t need to worry about anything since all operations will be automatic. This is just like operating an auto best robotic pool cleaner. You only need to do a few adjustments and the timer will activate at a certain time, heating up your pump and heater even when you are gone for days. An increase in the surface area will increase evaporation. And what might increase the surface area of your swimming pool? The answer is movement. And even when there are no swimmers in your pool, there is still one factor that can increase the surface area. This is the wind. The wind generates small waves when it moves across the surface of the water, increasing the surface area. So, you should block this by having a windshield. Solar pool covers bubbles up or down? Bubbles facing down is always the right way to install your pool cover. This will ensure more heat is transferred into your pool and the cover will last longer. How is it February already? I don’t know where the time goes but goes it does, and sadly of late there hasn’t been enough time for blogging. I’ve taken photos but never got around to posting them simply due to lack of time. This is why I am loving instagram, ‘cos I can snap a shot and post it, no intermediate uploading of photos and writing to get in the way. But despite my lack of time to blog, the garden keeps giving. 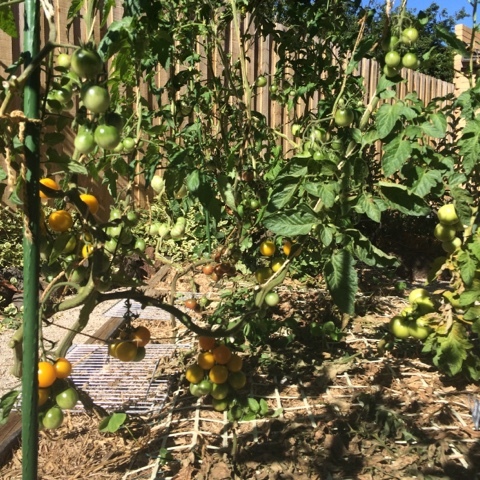 The backyard wicking bed patches are going great guns, although the tomatoes and eggplants have been slower than previous years. 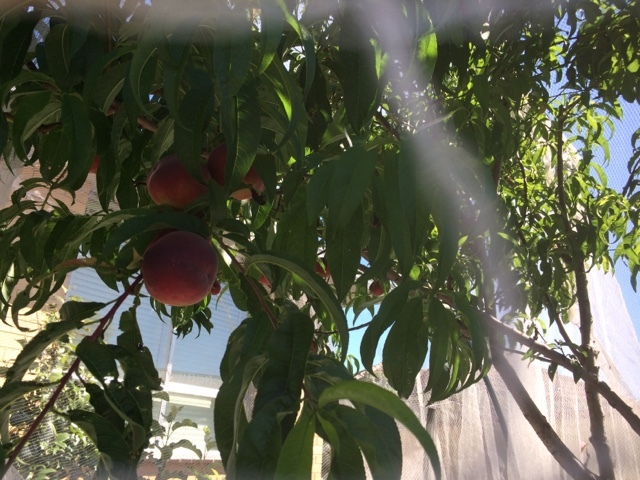 The peach tree has been netted and I’m enjoying the gorgeous white fleshed Anzac peaches daily. 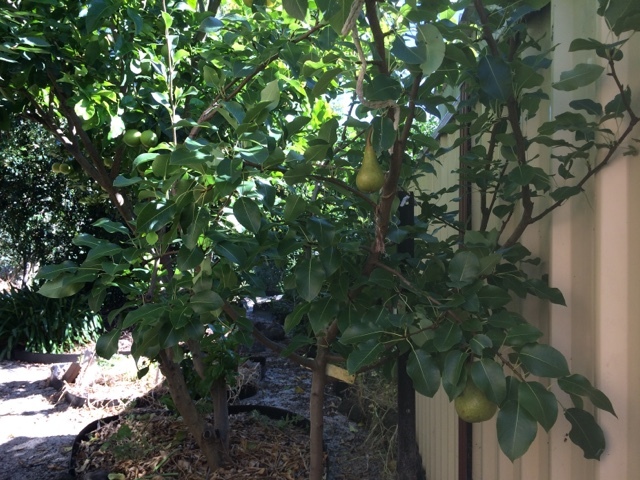 Pears are coming along and should be ready for eating in the next month or so. 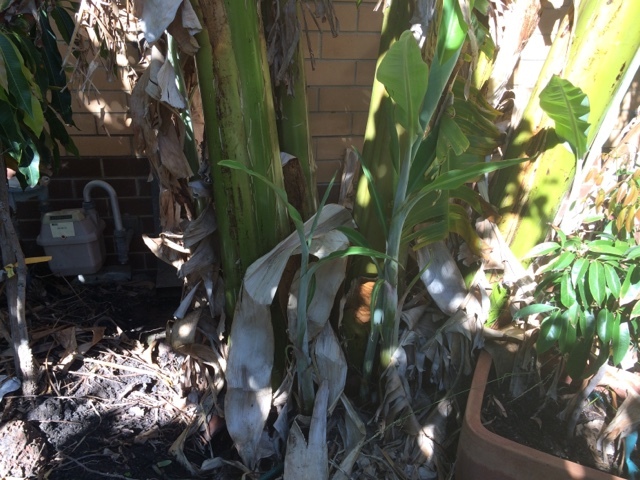 The front yard banana has gone gangbusters with new plants. I need to pot some of these up to give away and relocate some others. 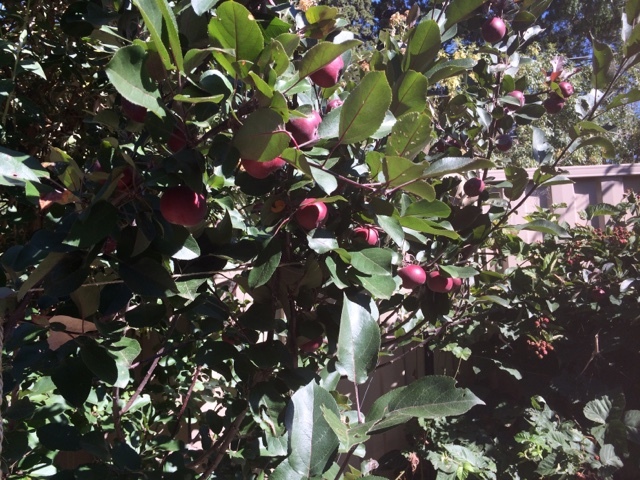 The Huonville Crab apple is almost ready for pickings. Might go nicely with some blackberries. 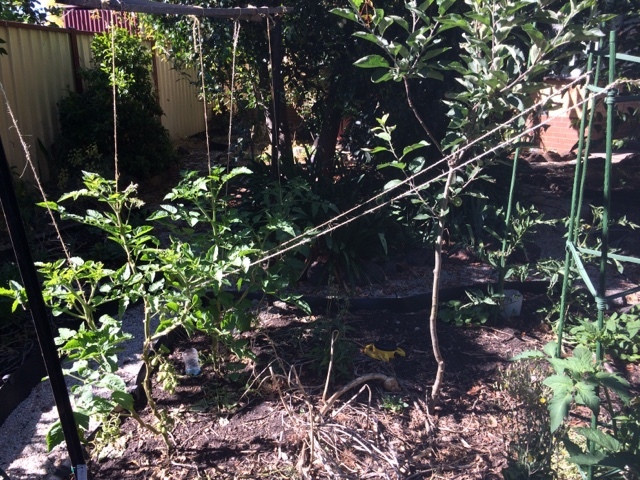 I’m stringing up the front yard tomatoes in all sorts of ways. Easily the best growing method I’ve come across so far! 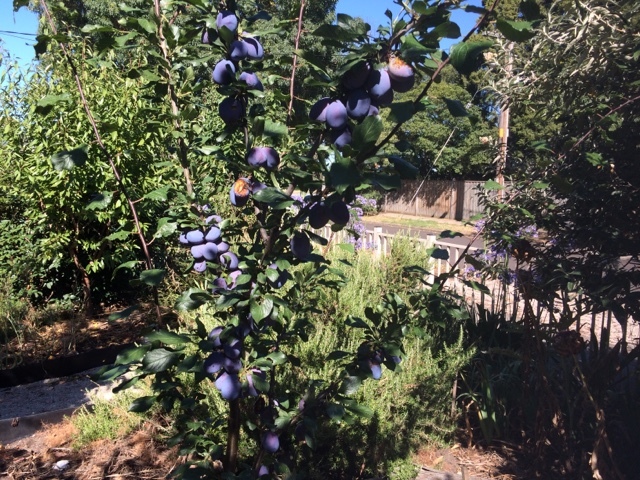 The plum which is supposed to be a prune, but I always eat them instead of drying them, is super laden this year. 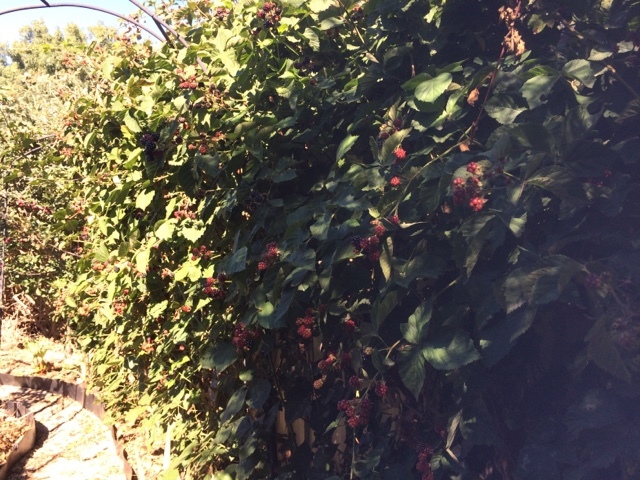 I ran out of time to net this one, but there are only a few bird pecked fruit. Inside the polytunnel I’ve gotten a few early Black Krim tomatoes, much earlier than all the other bigger and beefsteak tomatoes in the backyard. 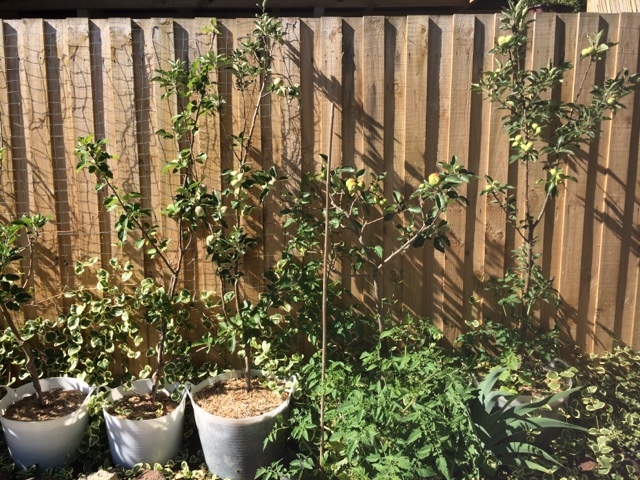 I’ve tried growing climbing beans up the apple espalier this year, very successful so will be repeating this one. 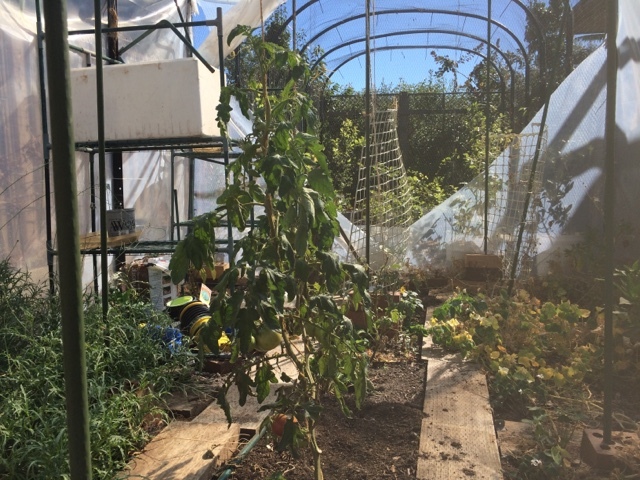 Also in the orchard area, the few cucumbers that didn’t die are now finally producing some fruit. 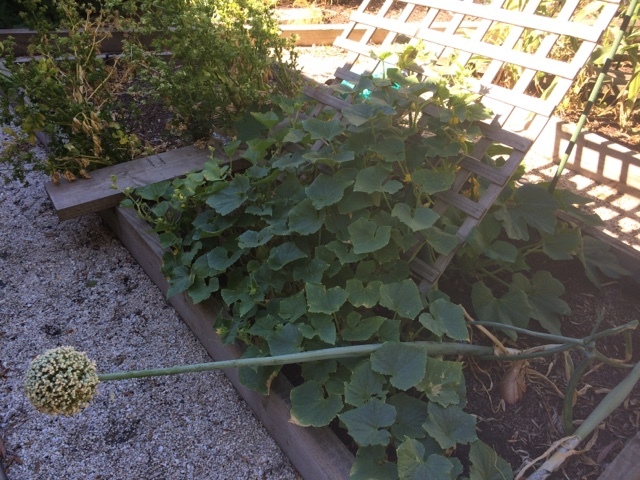 Also some onions that need picking and celeriac gone to seed. 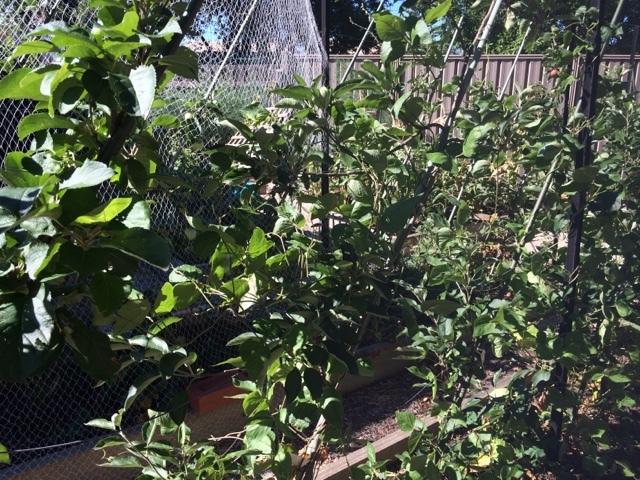 The apples in wicking buckets are also doing well. And a transplated tomato that I’m letting grow wild. 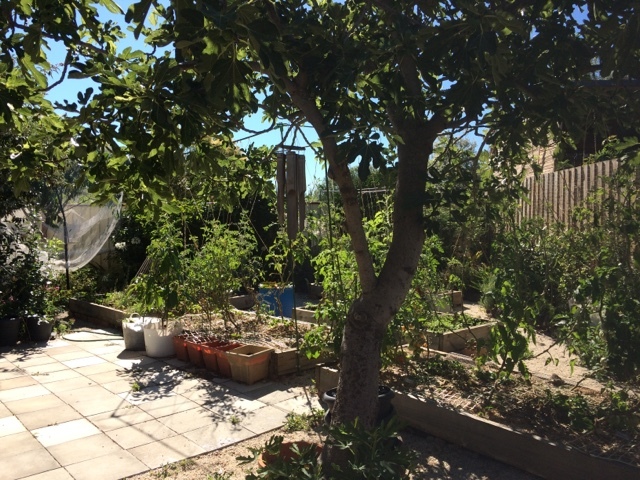 So that’s most of the garden. Hopefully I’ll get around to doing more blogging over the next few months compared to the last.